I was thumbing through a recent dead-tree copy of The Guardian and came across an ad on the back page of one of the sections. 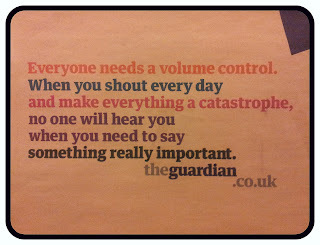 The ad simply read, "Everyone needs a volume control. When you shout every day and make everything a catastrophe, no one will hear you when you need to say something really important". Now of course this is exactly the sort of manipulative trite statement that is designed to make you pause and say to yourself, "you know, I know that's a manipulative trite statement, but they have a point...", but, well, it made me pause and say to myself, "you know...". I am, by nature, a very cynical and grumpy person. I am less a 'glass-half-empty' person and more a 'damn-those-capitalist-bastards-stole-my-glass-and-are-now-making-me-pay-for-the-privilege-of-watching-them-drink-champagne-from-it' type of guy, and having easy access to a platform from which to vent is akin to a junkie finding a Golden Ticket in his gear that gives him exclusive access to the magical CIA-funded Afghan factory where all his dreams are lovingly caressed from the fruits of shimmering ruby fields. Moderation is not something I am very good at when it comes to voicing my opinion. Whether it is bank bailouts and bond-payments or human feces on my doorstep, I am quick to condemn and colourful in my approach, and all things get treated with an equal amount of outrage. Or at least it did, until quite recently. Just over a year ago I wrote an article for Politico asking where all the anger was, why no one was taking to the streets. This May Day not only did I fail to take to the streets, I didn't leave the office until late in to the evening. While in the past I felt quite capable of balancing a reasonably hectic work-life with a passion for social activism, I have found that a spike in my Twitter usage has also corresponded with a sharp decline in my real-world protestations. In a nutshell, I have fallen in to the trap of Passivism, what passes for activism in the online world. I stumble home from the office drained and jaded, and although the fires of injustice still blaze inside me, the immediate gratification of switching on Vincent Browne and knocking out a few venomous Bon Mots at the expense of whatever conservative/religious right-wing hate-monger has been lined up for our evening's entertainment satiates the anger and ire in my belly. I go to bed with a sense of righteousness, that I have made a difference in the world by imparting my oh-so-insightful truths to the hundreds of like-minded individuals that follow me on Twitter, each of whom also sleep soundly at night, secure in the knowledge that their own soundbites shared across the internets have surely contributed to righting the scales of social justice, like a thousand bee-stings laying low the mightiest oliphaunt. But in the morning, we all rise and the beast is still there, trampling us all under foot and blissfully unaware that any of us even took aim the previous night. That is the"power" of social media, to let us all feel like we have taken a stand without ever once actually challenging the forces of our oppression. Fintan O'Toole called emigration the release valve of Irish societal pressure; in the 21st Century that valve takes a new form, and though the politicians shake their fists and gnash their teeth at Social Media, crying, "won't somebody please think of the children? ", they will never lay a finger on it for, like emigration and the pub, it keeps the angry kids off the streets while making a tidy taxable profit in the process. Everyone shouts online. The internets are written in CAPS LOCK and when everyone shouts, nobody has to listen. Nobody can listen. I went to see Noam Chomsky a few weeks ago. I, like most other Lefties of my age, grew up reading his diatribes on everything from the media to South America, and all of America's misdeeds in between. He was hosted by Front Line Defenders, a human rights organization whose patron is Denis O'Brien, and was interviewed by Brian Dobson. For an hour or more he railed against imperialism and hegemony, and the audience clapped and cheered, and all of us good little Lefties slept soundly that night secure in the knowledge that our presence there had made the world a better place. But as we all listened closely to what Chomsky was saying, it suddenly dawned on me that what we should have been doing was listening to what he was not saying. He has a mesmerising way of pointing out all the ills of the world, so enticing that you completely fail to notice that not once does he offer any suggestions for how to make things better. For all we think that he challenges the establishment, all he really does is highlight the ills of the world, and in doing so he gives us permission to believe that simply by being aware of the wrongs we are helping to make things right. Chomsky writes in CAPS LOCK. Chomsky is the internets. We get our Two Minutes Hate, our system is cleansed and we return to our fluffy mochaccinos, happy and content with ourselves and all the good that we have done, simply by hearing his words. In the morning we awake, and the world has changed not one iota for all the awareness we now proudly puff up our chests with. Just as Chomsky now sits two degrees of Kevin Bacon from Denis O'Brien, his outrage on the night neutered by this connection to the physical embodiment of Irish neo-liberal ultra-capitalism, so too are any protestations shouted out across the Tweet Machine or rallies organised through the Facebooks. For every online activist action there is an equal and profitable capitalist reaction, ca-ching, ca-ching, ca-ching, all the way to the Cayman Islands via Amsterdam and the IFSC. At last week's 1913 Unfinished Business public meeting, a speaker quipped that "Austerity is working, it's working for the people it's designed to help. It's a forced transfer of wealth from poor to the rich". In the same vein then let me say then that Social Media is a powerful tool when it comes to activism and protest, but who wields that tool is not the activist, but the invisible hand of capital that sits behind the network, profiting from every communication while stymieing action in the Real World, the only activity that can actually lead to change. I'm not going to stop using Social Networks, by now they are too ingrained in to almost every aspect of my life. But just as Caesar had the slave travel behind him in the chariot, whispering, "hominem te memento - remember you are but a man", so too will I stick a post-it note to my screen saying, "Social Networks are not The Real World. Shouting here does not fix anything". Shouting here does not fix anything.